Midwives have been around for a long time now, even before there were doctors and proper hospitals, playing a major role in the pregnancy, birth and postpartum period in a woman’s life. Today, even though medical science has developed by leaps and bounds introducing innovative, revolutionary cures for even the deadliest of maladies, the role of the midwife remains the same. Of course, now she is assisted by a team of professionals and has far better medicines and equipment, but her duties remain the same. 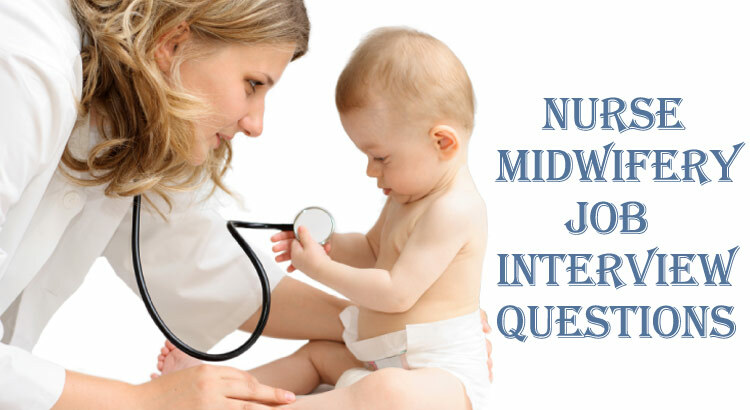 How to prepare for the Nurse Midwife interview position? You simply cannot show up at an interview unprepared and completely clueless as to what the job entails. The interview is but a test of your abilities; they just want to see how well you fit in with the institution and can further contribute to it. Once you have received the call letter, read the selection criterion and qualifications carefully. Then, think through your strengths- think about the reasons why you are perfect for the job. Viewing yourself from an objective angle is extremely important when you’re preparing for an interview. For, it is only when you are aware of your true potential that you can express and explain it convincingly to the other person. Next, read through the competency standards set up by the government for nursing officials. Interviewers are very keen to see how well you understand and implement these principles in real life. Lastly, try collecting information on the hospital that you wish to apply for. Always be on time. Punctuality is a pretty coveted trait in the medical industry. Also, carry yourself well. The interview is not just a test of how well you answer a few questions but also of how you conduct yourself. Your body language, personality, and attire have a big impact on the kind of impression you make on the interviewer. Be absolutely clear as to why you wish to be a midwife and what motivates you to choose midwifery as a career. Every interviewer would ask you that. Read up on the recent developments in the healthcare sector. This might include new government reforms, policies, technological advancements and treatment procedures. Do your homework on the institution as well. The interviewer might want to know your reasons as to why you chose the particular organization. It is best that you look up the popular platforms like Royal College of Midwifery, Royal College of Nursing, Nursing and Midwifery Council, and the Nursing Times for further help. This is most probably the first question asked at any standard interview. The employer simply wants to break the ice and make you more comfortable with the surroundings. Prepare a generalized introduction of sorts stating your name and some personal details (don’t divulge into discussing your life in detail, the interviewer is not really interested to know). Talk about your academic qualifications. You can also mention any previous job experiences, programs, and projects you’ve been a part of in the past. 2. Why did you choose to be a nursing midwife? This is one of the clichéd questions asked in almost every interview. Here the interviewer wants to understand how serious you are about the profession. The medical sector is suitable only for people who have the empathy and a desire to serve the sick and suffering. Talk about how you want to help ease the pain and discomfort of the mothers and welcome new life. Try not to be overly sentimental though, discuss the practical aspects of the position as well. For instance, the monetary benefit, the high pay-scale, and exposure you’ll be getting in the field are major incentives. 3. What specialty within the midwifery interests you the most and why? Midwifery is not a one-dimensional course; there are several sub-divisions and categories within the profession that you can choose from. The interviewer wants to check your dedication towards the field and see how well-informed you are. Revisit your training portfolio and just try to recollect the areas that you found the most interesting and appealing. For instance, you may be keen on learning about community care and education for pregnant mothers as to how to take care of themselves and the baby. Discuss the various areas in midwifery where you’d want to specialize in to show the employer how versatile and diverse your knowledge regarding the profession is. 4. Do you have any prior experience as a midwife? Most candidates that apply to the more prestigious institutions already have some experience with midwifery. They have either assisted doctors or have seen a life delivery in the labor room. In short, almost every candidate is aware of what happens inside the labor room and how to deal with it. You can even talk about any previous projects or programs that you had participated in. The interviewer can also ask you the reason as to why you left the previous organization. Talk about your past job experience without directly bashing the organization as it leaves a very negative impression on the panel. 5. Can you cope up with the pressures of the training and rigorous shifts? Nursing midwives have the most tiresome and exhausting schedules ever. You can be called in anytime to report for duty. Also, you don’t really get holidays at hospitals. Most of the times your routine would be jam-packed with all the surgeries and deliveries you’ll have to supervise or assist. The interviewer wants to check your dedication to the job. This is a trick question that can go either way. You can either really impress the interviewer or give him a clear reason to reject you. The question gives you an opportunity to stick out from the rest of the group and make a mark on the mind of the employer. Simply saying that “I need the job” or “I’ll do a good job at it” doesn’t really make an impression. Focus on stating your skills and weaknesses as objectively as possible. Highlight your achievements and tell them why you are an asset to the organization. Here, the interviewer is trying to gauge how well aware you are about the future prospects in midwifery. The question also aims to check how committed you will be to the job or the institution. Talk about your future plans and goals as honestly as possible. It gives the employer an insight into your personality. Do your research on the future prospects offered by the organization itself and discuss the long-term plans you have for yourself. Now is also a good time to mention your salary expectations and plans regarding how you’d want to specialize in your area of interest in midwifery. 8. How do you propose to promote the health and well-being of young mothers and postnatal patients under your care? Pregnant women are most gullible to emotional, physical and mental problems as their hormones are always on a high. As a midwife, your responsibility is not just restricted to delivering the baby. You also have to ensure that the mother is in perfect health and is happy. Your job is to identify and assess the various issues mothers have to deal with during and after their pregnancy. The interviewer here wants to know your view as to how you would encourage them. Earlier we discussed some probing questions to be asked in an interview for midwifery position. Here we will talk about your conduct and the things to do when you are facing the panel of interviewers. Don’t dwell too much on the interview once it’s over and done with. You have given your best shot and there’s nothing much you can do about it now. Also, refrain from discussing the questions and your responses with other candidates waiting outside. It might give them an unfair advantage over you. The positions will be decided on the basis of the points you score in the interview and the rank you stand at. The rank also decides the institutions and hospitals you’ll be eligible for applying. Simply passing an entrance examination or holding a degree does not guarantee that you become a nursing midwife. An ideal midwife must possess nursing qualities like compassion, empathy, kindness, honesty, integrity, resilience and adaptability. The interview is an opportunity to meet potential employers and inform them about your abilities. It even gives the interviewer to assess your strengths and judge whether you’ll be compatible with the organization or not. The entire experience can be pretty stressful; however, with preparation and self-confidence you can easily impress the panel and make a lasting impression.